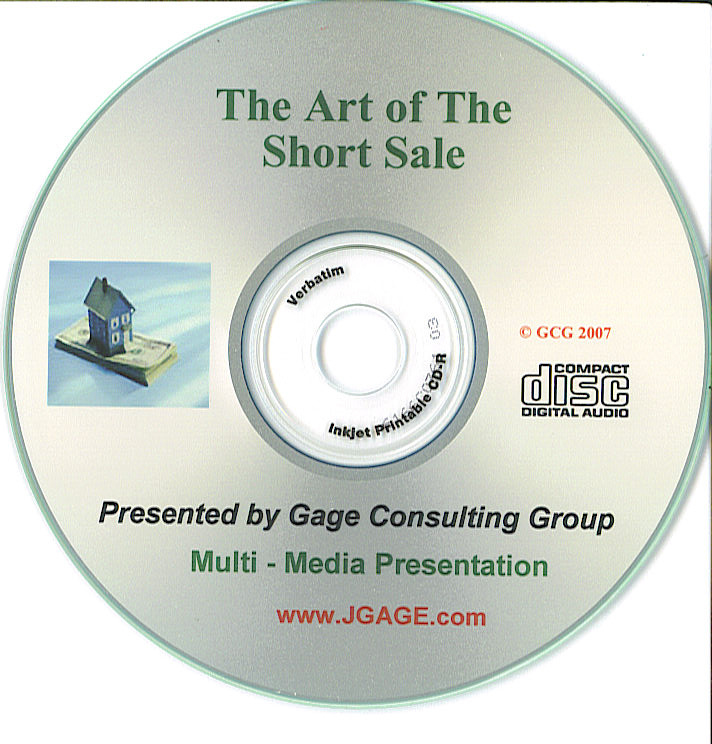 SPECIAL NOTE: INCLUDED WITH THIS DISC IS THE SHORT SALE OFFER FORMULA REPORT, THE REPORT THE BANKS DON'T WANT YOU TO KNOW ABOUT. That’s the key word Successful ! Many investors attempt doing short sales, but few are successful ! Why? Generic information, out dated material and old worn out tactics. Foreclosures in the US are at an all-time high, some parts of the country have seen foreclosures up 65% . During the next 20 months there will be even more foreclosures due to interest only loans coming to maturity; these loans make up 70% of the market according to the federal government. So what is an investor to do? Should they forget about cashing in on this foreclosure epidemic? Should you sit on the side lines and wait the cycle out? The answer is NO ! Description: James Gage — undoubtedly one of America’s premiere authorities on creative real estate investing and negotiating — will provide precise and targeted advice on how to achieve financial independence in today's sizzling distressed real estate market. During this presentation, James will touch on the firsthand strategies that helped him become successful. In particular, he will focus on the relatively unfamiliar — yet extremely lucrative — real estate investing technique known as the short sale. In short (no pun intended), purchasing a property in foreclosure for less than what the seller currently owes the lender is considered a short sale. From afar, negotiating a short sale seems like a tricky process. But as you’ll find out, there’s really nothing to it, if you have the right information and guidance. James has achieved not only personal success, but he has also helped thousands of others reach their dreams of becoming entrepreneurs. You could be next! ü What words will get the bank to beg you to take the property! ü Save thousands of dollars in costly mistakes by recognizing pitfalls and potential danger zones. Bonus 1 : How to Make a Short Sale Counter Offer. “I have attempted short sales before – unsuccessfully. I figured I would give it one more try with James’s techniques and take on the industry. Guess what? It worked! I will be closing on a property next week, with many more in my future I suspect. Expert: James Gage started out with no money, a desire to succeed, and a great amount of common sense. With these ingredients, he mastered the real estate market in a very short time and began creating concepts and techniques that are the backbone of the Gage Success Formula. In the early stages of his real estate investing career, James obtained his real estate license and began to sell properties. He soon realized that the properties could be controlled easily without even owning them through a Lease Purchasing and a Negotiating System. He soon controlled duplexes, multi-family homes, condos, town homes, mobile homes, pre-foreclosures and probate assets with this method. During this same time, he began to incorporate short sale investments and related strategies. Through his firsthand experiences, James learned that there are four main creative strategies that can net a six- to seven-figure income: Rent to own, lease purchase, short sales and probates. James believes that when investing in real estate or pursuing any other endeavor that confidence and negotiation are the two biggest advantages of successful entrepreneurs. In addition to his real estate and legal expertise, James holds a vast amount of credentials, including an accounting degree, financial and estate planning background, as well as an IRS Arbitrator. Unlike many educators and mentors, James continues to actively pursue real estate investing. In fact, he has even been quoted by CNBC's Maria Bartiromo on the condition of the real estate market. He has also appeared on hundreds of high-profile radio programs across the nation. To date, thousands have taken James’ one-on-one mentoring program and these students use his formula everyday to become financially independent. Now it’s your turn thanks to this exciting multi-media presentation. Get started making money using SHORT SALES! AND, as in all my products . . . You'll learn MUCH, MUCH, MORE!